Thrifty homeowners know the value of sharing the load, such as banding together to rent a snowblower or throwing a blockwide garage sale. 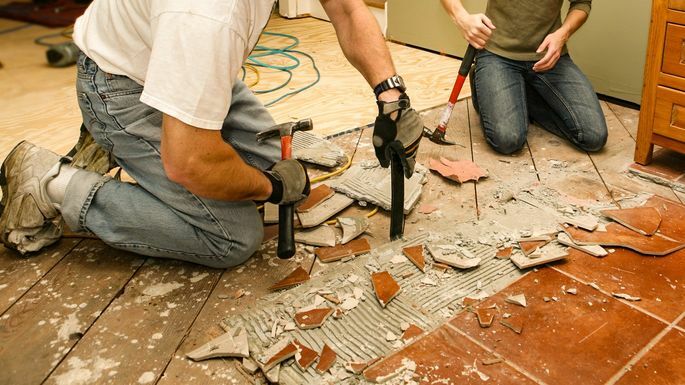 But would you ever ask your neighbors and friends to help you remodel your house? That's exactly what Jamie Novak and her husband did eight years ago, when they called on family and friends for help to demo their condo kitchen. "It was built in 1960, so the wallpaper, Formica cabinets, and vinyl floor had to go," she explains. And by not outsourcing the demolition, they saved some major cash. It might seem like a scary endeavor to have a whole group of amateurs whacking the walls of your home. But it can also be liberating. Novak, for one, is extremely proud that everything was worked on by her, her husband, or a friend. If you're feeling up to the challenge, you, too, can throw your own home demolition party that's fun and productive. Just keep in mind these eight crucial things before any of you swings a sledgehammer. Before you even create that event invitation, check the fine print in your insurance policy. "It's best to know what your policy covers in case one of your neighbor's properties gets damaged or if you were to damage underground city utilities," explains Andrew Hecox of Air Capital Roofing. And note whether personal liability coverage is included for medical expenses, pain and suffering, and lost benefits—in case one of your guests gets injured. Not sure about the details? Call your agent. "Oftentimes you can get an umbrella insurance policy added to your current one if you're not completely covered, for that extra peace of mind," he adds. And have a frank talk with your friends about their ability to get down and dirty with the proposed demolition task. Of course, not every home demo lends itself to the DIY approach. 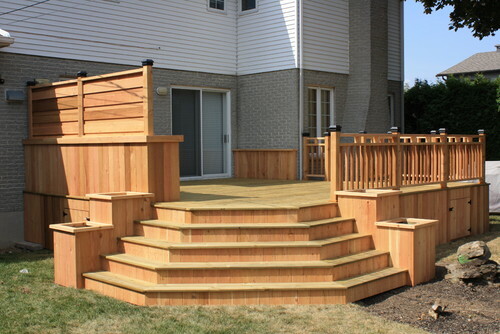 If you're looking for an easy project to tackle, homeowners with limited experience can handle the removal of an old deck, screen porch, or kitchen cabinets, says Kevin Busch, vice present of operations at Mr. Handyman. "But steer clear of projects requiring a licensed tradesperson, such as electrical wiring, plumbing, and HVAC," he notes. Also off the table: window replacement, roof repair, and attic insulation. Hecox warns DIYers to avoid taking down load-bearing walls and to skip anything concrete-related. "I would avoid these unless you are comfortable operating heavy equipment or have experience with a small Bobcat," he cautions. Always be sure gas, electricity, and water are turned off or capped before beginning any project that touches on these utilities. You should also call 811 to have someone mark underground wires on your property before you dig, Hecox says. No shoes, no shirt—big problem. Urge your helpers to wear work clothes and heavy-duty boots, and then be ready to provide the rest, including safety goggles, gloves, and dust masks. "You'll also need a first-aid kit and plenty of hydration on site, especially if the weather is warm," Hecox says. If you're hosting a demolition party, Busch says to protect your rooms, too. Contain dust, debris, drips, and damage by using dropcloths and hanging plastic sheets, he recommends. And don't forget to rent a dumpster for larger projects. One caveat: If your home was built before 1978, it's best to consult with a professional before you invite people over to tear things up. It's possible there might be lead-based paint or asbestos lurking in your walls or ceiling, and professionals should be the ones to handle this high-risk material. 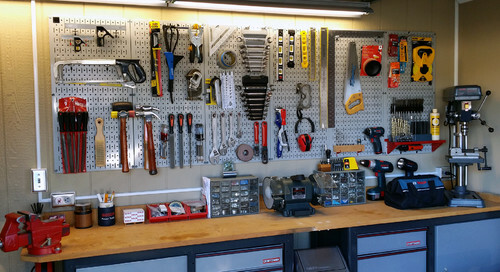 Depending on your project, you'll want to have enough hammers, nail bars, crowbars, sledgehammers, cordless drills, and utility knives or box cutters on hand. And don't forget a wheelbarrow and empty buckets for hauling debris, industrial-strength garbage bags, and brooms, Hecox recommends. When it comes to power tools—including jackhammers and all manner of saws (chain, reciprocating, circular)—be very careful. Unless your friends are familiar with these, stick with a more basic toolbox. "If someone in your crew has never even used a handheld, cordless drill, they are not a candidate for these other items," Busch says. Keep in mind that most residential trash pickup is not suited to large amounts of drywall, wood, and nails. And whatever you do discard—strive to be eco-friendly about it. For example, always separate metals from wood and find out if your municipality has shingle recycling, Hecox says. Some companies will grind up asphalt roofing, which can be used to make more shingles or blacktop for roads. 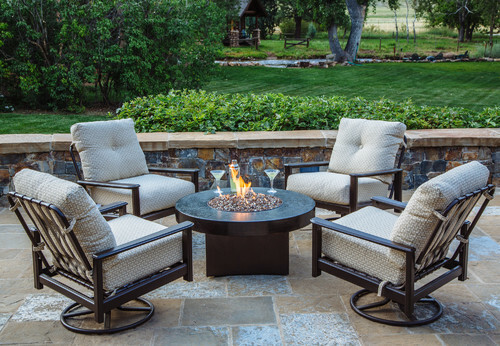 If it's hot out, have plenty of (nonalcoholic) drinks on hand, and if it's cold, consider a small fire pit off to the side for quick warmup breaks, Hecox suggests. And at the end of the day, cold brews and pizzas will go a long way toward thanking your DIY team.